After my First Day of School post the other day, Christine at Origami Mommy asked if I had any tips for teaching boys how to use hacksaws safely. She brings up a very good point. Normally, young children aren’t given tools to use. Plastic tools? Maybe. A real life, straight-from-Home-Depot hacksaw? Not so such. He also knows that one of the first rules of tool safety is to Use the right tool for the job. Kitchen knives are designed to chop celery and slice bread, not hack through cardboard tubes. So he picked up the saws, which are lightweight and feature very finely-toothed blades. If handled properly, the blades will cut, but they’re not so sharp as to deliver a cut at just a touch. The saws also have study handles which keep little hands far away from the cutting field. I also implemented the second rule of tool safety: Supervise children using tools. Young children need to be taught how to use tools safely (which brings up rule #3: Model proper tool use.). Then, they need direct supervision as they learn to handle the tool on their own. 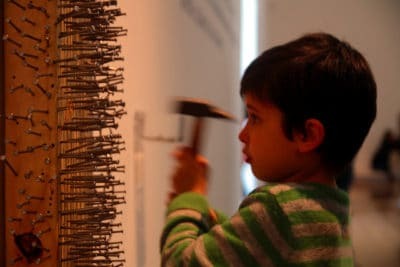 It’s not enough to toss your son and hammer and say, “Here, use this.” First, you must show him how to hold the hammer and, more importantly, how to hold the nail. Then you watch and guide and tweak as needed. Only when you feel confident in his abilities do you step away — and even then, it’s best to remain in reach. We also talked about rule #4: Store and carry tools safely. My kids know that screwdrivers must be carried point down, and we talk constantly about the need to put tools away after the project is completed. I’ll be honest, though: My boys aren’t so good at this rule. They left the hacksaws laying on the floor (“But Mom, I was going to use that again! I swear!”) and their three-year-old brother picked one up — and dismantled the saw before I knew what happened. An engineering project for him, but a slightly dangerous one he had no business undertaking. For more information about kids and tools safety, check out this article from This Old House. This is really helpful! Similar in some ways to teaching children about kitchen safety. I like how you don’t mention an age to begin, because it really depends on the individual child and it’s important for parents to observe their own children and their readiness to adhere to these safety rules. Thanks, Christine. I’m glad you liked it. I think you make a great analogy in kitchen safety. And I love your last comment, about not mentioning a specific, arbitrary age. I’ve really tried to stay away from “you can do x when you’re y” pronouncements around here, because while one child may be ready to handle a BB gun at age 9, another might not be ready until he’s 12.